Go World magazine, the English world's premier source of go information for more than three decades, is now available in digital form! All 129 issues, from 1977 through 2012, including rare early ones no longer available, have been lovingly scanned to maintain the exact look and feel of the original. The archive contains a wealth of game commentaries, articles, problems, and news. An extensive index allows you to find exactly what you want in any of the 129 issues. Full-text search is available across the entire archive of more than 8000 pages. 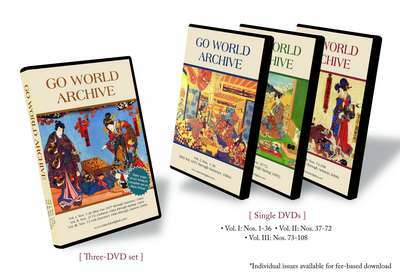 Go World Archive can be used on any computer with a DVD drive and Adobe Reader software. Go World Archive is the indispensable addition to your go library, the equivalent of hundreds of go books for a fraction of the price. Note: Vols. I-III are fulfilled through CreateSpace, which requires a credit card with a billing address in the country to which the product is being shipped. Vol. IV is fulfilled through Kunaki, which accepts PayPal. If this is a problem for you, please contact us. Full-text index. Search across all 129 issues with this index (18MB) for Reader. Unzip the files into the directory where you keep your downloaded issues, choose the [Edit | Search] menu item in Reader, select "Use Advanced Search Options" at the bottom of the pane, then choose "Select Index..." from the "Look In:" dropdown menu and point to "Go World Archive Index.pdx". Note: The full-text index is also available on each DVD.